This pattern makes a fun and lovable penguin doll. Our penguin pattern will allow you to craft an adorable stuffed penguin and has the option of becoming a write-on and wipe-off doll for your child. The patterns for this project are available for only $1.95. 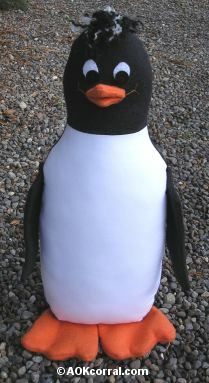 The pattern download includes the penguin pattern with sewing instructions. *This penguin doll may be used as a write-on / wipe-off doll if you purchase a special marking pen from your local fabric store. Purchase the disappearing ink pen. Test the pen on a sample piece of the fabric you plan to use for the front of the penguin to make sure that it will disappear when rubbed with a wet rag. Cut out each of the pieces for the penguin doll according to the directions given on each pattern. Patterns for the penguin doll are available through the link in the materials list above. All seam allowances for this doll are 1/4 inch unless otherwise stated. Finished Penguin Doll measures approx. 13" tall and 6" wide. Take the yarn color(s) you wish to use for the hair and wind it around 4 of your fingers about 3 or 4 times. (see photo) Slide the yarn off your fingers but hold it together at one end. Lay that end of the yarn on one half side of the black flannel strip that you made. Take the other half of the strip and fold it over the yarn to incase the yarn. Sew through all thickness using your machines zig-zag stitch. Unravel all the 4-ply yarn pieces to make the yarn look more like hair. Sew the front head to the front body. Press seam allowance toward the front head. This piece will now be referred to as the "front". Lay the penguin "front" on your sewing table with right side facing up. With right sides together, pin the penguin back to the penguin front. Sew the penguin body pieces together around the body leaving the bottom of the body open. Make small cuts in the seam allowance along the curves. Turn body right side out. Thread your sewing needle with white thread. Fold the seam allowances at the bottom of the penguin body toward the inside and use small stitches to sew up the opening. To make the penguin beak; with right sides together, match the tip and edges of Beak Piece #2 along the tip and edges of Beak Piece #1 and sew along the seam lines as shown on the pattern. Next; with right sides together, match the tip and edges of Beak Piece #3 along the opposite tip and edges of Beak Piece #1 and sew along the seam lines as shown on the pattern. Thread your sewing needle with the orange embroidery floss and knot the end. 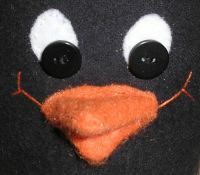 Find the location you want to place the beak on the penguin's face and begin to sew just inside the edge of the orange felt all around the beak using a running stitch. Stitch lines for a smile at the corner of each side of the beak if desired. To end your stitching with a knot, tie off in a knot under the edge of the orange felt at the bottom of the beak so it will not be seen. Thread your sewing needle with white embroidery floss and knot the end. Place one of your white eye pieces where you want an eye and sew it on using a running stitch again just inside the edge of the white felt. Again, make sure to hide the knots under the edge of the white felt at start and finish. Sew on the other white eye felt piece. Thread you sewing needle with black embroidery floss and knot the end. Sew a black button onto each of the white eye felt pieces. Clip into the seam allowance around curved edges. Turn the feet right side out. Thread your sewing needle with some of the orange embroidery floss, fold the seam allowances from the opening in the foot toward the inside and then use small stitches to sew up the opening. Sew two penguin flipper pieces with right sides together as indicated on the pattern. Clip into the seam allowance around the curved edges. Turn the flipper right side out. Fold the seam allowance from the opening in the flipper toward the inside. Using your sewing machine with black thread, edge stitch along the entire back edge of the flipper. Repeat for the other flipper. 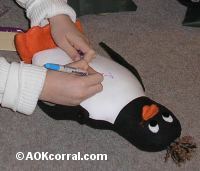 To attach the flippers, position a flipper onto the side of the penguin about where the body finishes widening and using the placement mark from the flipper pattern. Place a black button at the button mark on the flipper and sew the button on through the flipper and the side of the penguin. Sew the button on through the flipper and side several times for strength. Repeat to attach the other flipper to the penguin. Thread your sewing needle with orange embroidery floss. Fold one foot along the "attachment line" shown on the pattern. Stitch the foot in place along this fold as far as it touches the penguin body bottom. Repeat to attach the other foot. Fun for the child (or adult) that loves penguins!